I see you are eating mostly healthy food, that's really good! I like your blog a lot, I think you are really smart, beautiful and friendly :) I find your blog really inspiring! Looks delicious! Is that mayo on your sandwich though? You should try vegenaise instead :) its healthier and tastes very similar! Yumz! I'm curious to know how many calories are in this meal? Love posts like this one! I would be so hapy if you often made videos where you show us some healthy recipes! It would be great. Also I would be very thankful if you post pictures of what you eat (like today) but more often in your blog. Cause it really helps me to stay on track. 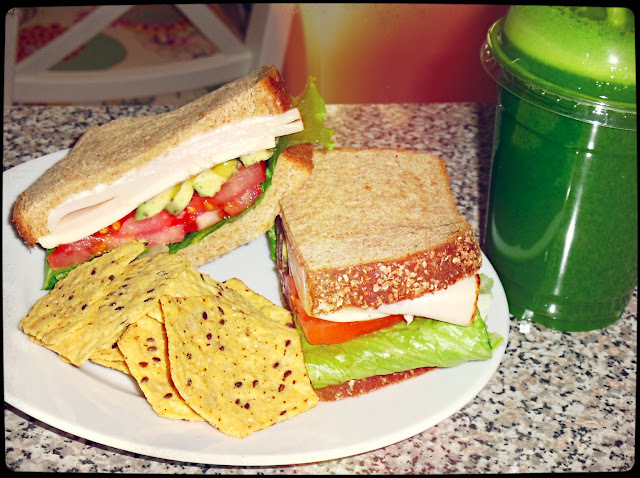 For example, today I felt like having junk food , but when i saw your lunch I was inspired to make a green juice instead. So amazing! thanks! Hey you can speak french ? i mean fluently..?